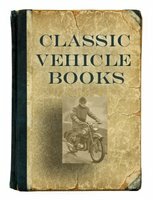 Pontiac Grand Prix car books include the development of the Grand Prix automobile, plus manuals. The Pontiac Grand Prix was an automobile produced by the Pontiac division of General Motors introduced for the 1962 model year. 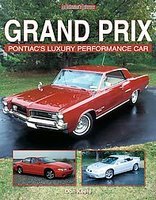 Grand Prix: Pontiac's Luxury Performance Car by Don Keefe (2007). From the earliest design sketches of the late 1950s, bringing the concept to market, all production figures to date, to the exciting Grand Prixs of today. Not simply a rosy depiction of the Grand Prix's history, the author also deals frankly with the darkest days of the 1970s and 1980s, leading to its rebirth as an exciting front-drive sport coupe. Also covered are experimental, showcar and specialty versions of the Grand Prix. 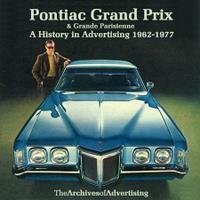 Pontiac Grand Prix And Grande Parisienne: A History In Advertising 1962-77 by William McBride (2001) CD ROM. Over 110 ads in colour and black-and-white including some from Canada, where the car was called the Grande Parisienne. Pontiac loved taking European motor-racing terms and making them its own. As a luxed-up Catalina or a narrow-fanny "personal luxury performance car", the Grand Prix kept its identity: a gentleman's carriage that could bop you in the nose if it felt like it. This CD-ROM contains a browsable collection of ads carefully scanned from original magazines and newspapers.